Boiling liquid produces steam, which creates a hot and humid environment around the food, cooking it gently. The flavours are trapped so they can't escape, and gentle cooking preserves both the flavour and the nutritional value of your food. >> It's light: no (or very little) oil or fat is used. >> It's healthy: vitamins and minerals are preserved. >> It's tasty: the food soaks up the flavours of any herbs and spices used. 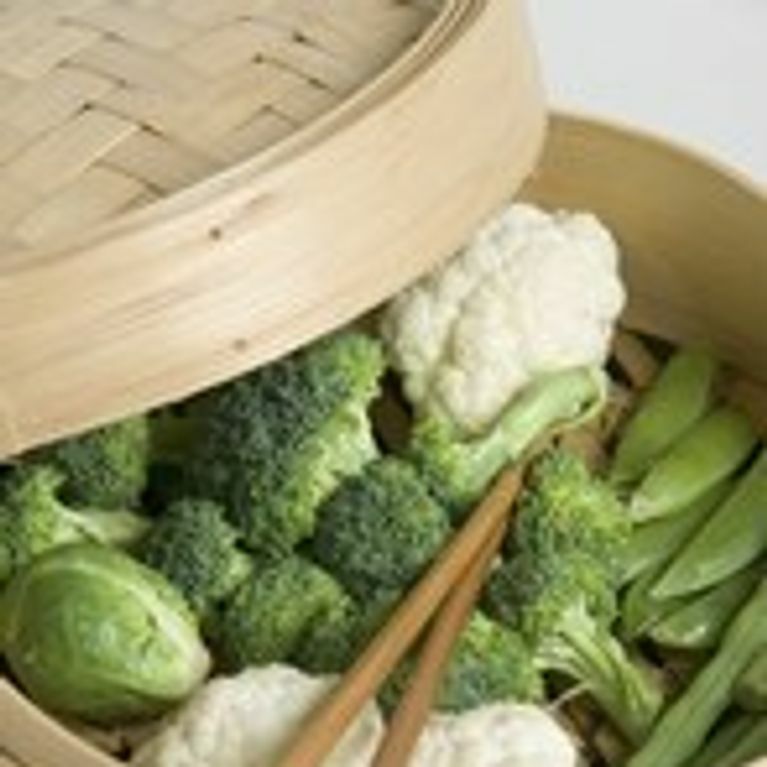 >> It makes magic stock: the water produced by steam cooking is a real purgative, detoxifying concentration of vitamins. Still, it should be consumed in moderation! >> It's foolproof: you can't burn a thing! The worst that can happen is your food will be overdone - and even at 100°C, there's not much chance of that. An electric steamer generally has 2 steaming bowls that are placed above a base which contains water. It takes up space but is very practical and allows you to cook vegetables at the bottom and fish at the top for example (or large quantities can be cooked in 2 bowls). You can quickly re-heat rice and pasta in a steamer without making it sticky. You can use a couscous pot to make couscous and any other steamed recipe (you can even use the stewpot for other recipes). It takes up a lot of space, but it's dead handy. This Asian steamer looks pretty and can be brought to the table (it has a lid to keeps food hot). It doubles up as a serving dish, too. However, it can't be used to steam everything. Pan + strainer + tea towel No specialist equipment required! Place the strainer (not a plastic one!) over a pan of boiling water, line the inside with a tea towel and cover. The steam might escape a bit from the sides or through the tea towel. >> Place fresh or dried herbs under the ingredients you're steaming. >> Use flavoured stock instead of just water (try adding white wine or fish stock). >> Put herbs or spices in the water, such as lemongrass or dried thyme. >> Sprinkle with coarse salt or sea salt. Reheating: no risk of overcooking. Cheese dishes: too much damp isn't good for them. Tarts, quiches, crispy dishes, fritters, filo pastry. Tip: Make sure you don't steam food that doesn't go together at the same time. You don't want the pudding in the top half of your steamer to taste of the artichokes cooking in the lower compartment! Does Music Change The Way Our Food Tastes?